When you want to publish videos on a website there are several different methods of doing so. In particular you will be faced with a choice between uploading it to a video sharing platform (such as YouTube) and then embedding the video, or self-hosting it and either streaming it from your own server or providing a download link to your video. Regardless of which you choose, the one thing that you will need to do is convert your video so that it is in a suitable format. To do that you will find that the ideal video file converter to use is Movavi Video Converter. When you do want to use Movavi Video Converter to convert your video for websites, there are several criteria that you need to keep in mind. If you intend to upload it to a particular online platform then it would be best to adhere to the recommended format and video settings of that platform. On the other hand, if you are self-hosting the video then you may want to adjust the video parameters and compress it to conserve bandwidth. In any case, all you need to do to actually convert the video itself using Movavi Video Converter is add it to the software and then pick a format and click ‘Convert’. If you like you could choose from the hundreds of presets that are available to automatically optimize your video for a particular device or platform. Additionally, Movavi Video Converter also includes several other handy features that will let you prepare your video by editing it slightly. 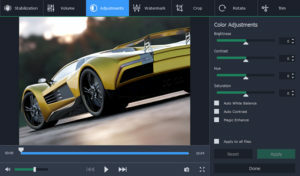 With these features you could cut your video into segments, join clips in a particular order, enhance the video quality, crop or rotate the frame, or even insert customizable text fields. That is by no means all that Movavi Video Converter is capable of. Truth be told it can also help you to convert your audio and image files, create animated GIFs out of video clips, extract audio tracks from videos, or grab screenshots from individual video frames too. At first having all those features at your fingertips may seem a bit daunting, but rest assured that Movavi Video Converter is really extremely easy to use. All it will take is a few minutes for you to get used to the interface, and you’ll be able to convert and prepare your videos for websites as you see fit.